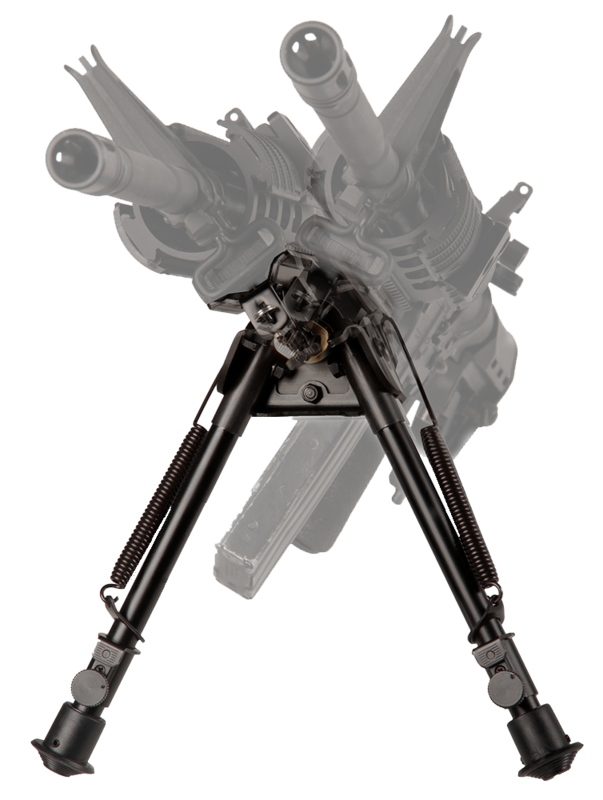 Accu-Tac HD50-0000 HD-50 Bipod 7"-10"
This bipod was designed for the 50 BMG caliber platforms.Description: BipodMaterial: 6061 T6 AluminumVertical Adjustment: 7"-10"Weight: 27.5 ozNo. of Legs: 2.. The Accu-Tac BR-4 G2 Bolt Action Bipod with the quick detach was designed, engineered, and manufactured in the USA. This smaller bipod is convenient for a more grounded shot. The BR-4 is 100% billet, made from the highest quality aircraft aluminum available.Description: BipodType of Feet: RubberMa.. The Accu-Tac F-G2 F-Class Bipod with the quick detach was designed, engineered, and manufactured in the USA. 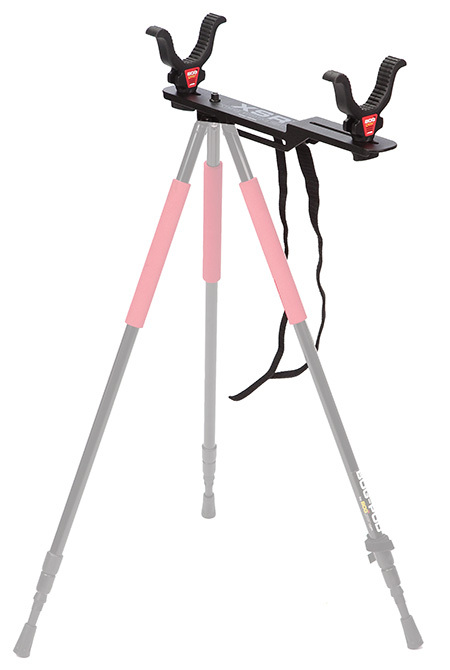 This bipod is perfect for long range, target, competition, and tactical shooting. The FC-G2 is 100% billet, made from the highest quality aircraft aluminum available.Description: BipodType o.. The Accu-Tac LR-10 Bipod with the quick detach was designed, engineered, and manufactured in the USA with big caliber gun owners in mind. The LR-10 is 100% billet, made from the highest quality aircraft aluminum available. Its wide stance and ratcheted leg extension gives you the adjustability neede.. 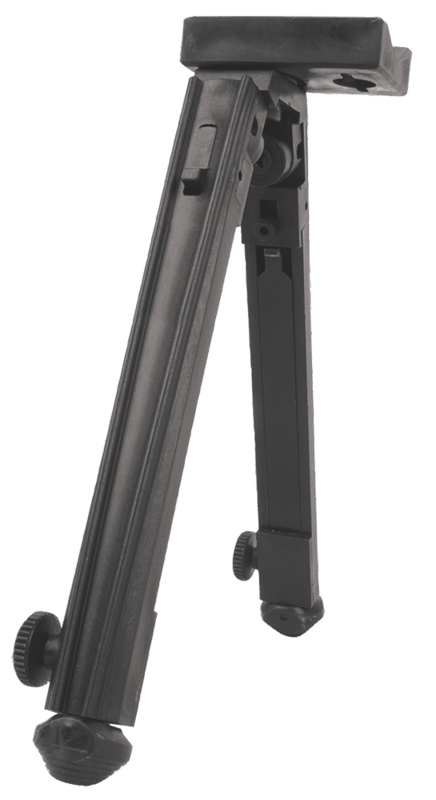 The Accu-Tac SR-5 Quick Detach Bipod was designed, engineered, and manufactured in the USA. The SR-5 is 100% billet, made from the highest quality aircraft aluminum available. Its wide stance and ratcheted leg extension gives you the adjustability needed for precision aim and repeatability. You will..
Advanced Technology BIP0300 Universal Featherweight Bipod Black 9-13"
The universal featherweight bipod will mount to any rifle sling stud. It can be adapted to an swivel or remain fixed, and easily adjusts from 9 in. to 13 in.Description: BipodType of Bag: N/APrefilled-Empty: N/AType of Feet: Non-Slip FeetCradle Blocks: N/AMaterial: AluminumVertical Adjustment:..
Advanced Technology BIP0700 SKS Bipod Black Polymer 9-13"
The SKS Featherweight Non-Swivel Bipod by ATI is a fixed bipod that mounts to the bayonet lug and easily adjusts from 9" to 13". 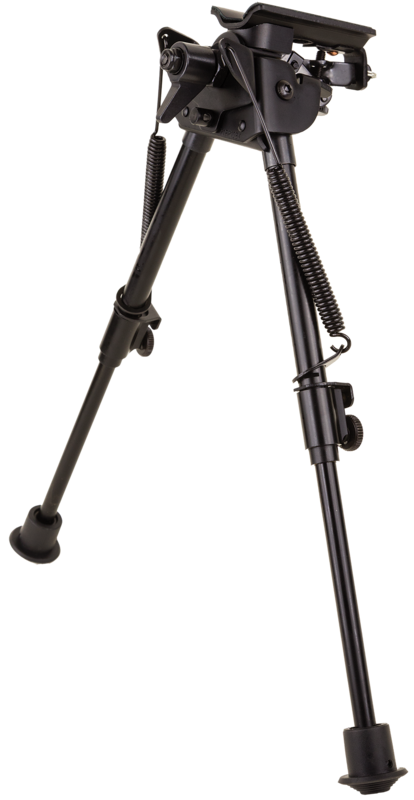 This 6-ounce weatherproof bipod features a "Snap-N-Lock" button that can be pushed to fold legs forward, rearward, or downward. The SKS Featherweight Non-Swivel Bipod incl..
Green window mount filed shooting bag.Description: Shooting RestType of Bag: Window Mount Shooting BagPrefilled-Empty: PrefilledAdaptor Type: Sand Bag Rest.. The Allen Intruder Bipod Shooting Stick is a sturdy stick that can be used for walking or as a shooting rest. It has a second leg that folds out to make a bipod rest for more stability.Description: BipodType of Bag: NonePrefilled-Empty: NoneType of Feet: SpikedVertical Adjustment: Up to 61"No. ..
Easy carry design. Adjustable front gun rest. Adjustable rear gun clamp. Adjustable feet. Sturdy steel frame. Removable ballast bag and sandbags included. Makes sight in easy and painless.Description: Bench RestType of Bag: Recoil Reducer Bench Rest & VisePrefilled-Empty: PrefilledType of Feet: ..
Battenfeld 1092515 Accumax Premium Carbon Fiber Bipod 6"-9"
The Accumax Premium Carbon Fiber Bipod securely attaches to any sling swivel stud. The carbon fiber legs are super strong and light weight, with non slip rubber feet Legs lock forward at 90 degrees or backward with spring loaded buttons, twist lock for fast incremental leg length adjustment. Secure ..
Battenfeld 1092516 Accumax Premium Accumax Premium Carbon Fiber Bipod 9"-13"
The Caldwell Hydrosled Shooting Rest holds up to 50lbs of media. There is 3.5" of horizontal gun fit adjustment to accomodate most rifles and shotguns, accomodates most detachable magazine rifles and lever action rifles. Features a rack and pinion elevation ram for precise adjustments, fine windage..
Battenfeld 1100484 Havoc HAVOC BIPOD CAMO 20"-40"
The Bog Havoc Bipod Camo is a highly portable shooting platform. The head rotates 360 degrees. Made of durable, aluminum construction with high density foam grips and quick, twist-lock leg deployment. The adjustable height is from 20" to 40".Description: Camo BipodType of Feet: RubberMaterial: Al..
Battenfeld 1100486 Switcheroo SWITCHEROO MONOPOD CAMO 22"-68"
The Bog Switcheroo Camo Monopod is a highly portable shooting platform with the patented Switcheroo mounting system. The head rotates 360 degrees. Made of durable, aluminum construction with a high density foam grip and no-slip lever locks provide secure locking and quiet release for the leg deploym..
Battenfeld 1100488 Switcheroo Lever Lock Switcheroo Lever Lock 18"-68"
The Bog Switcheroo Camo Adrenaline is a highly portable shooting platform with the patented Switcheroo mounting system. The head rotates 360 degrees. Made of durable, aluminum construction with a high density foam grip and no-slip lever locks provide secure locking and quiet release for the leg depl.. 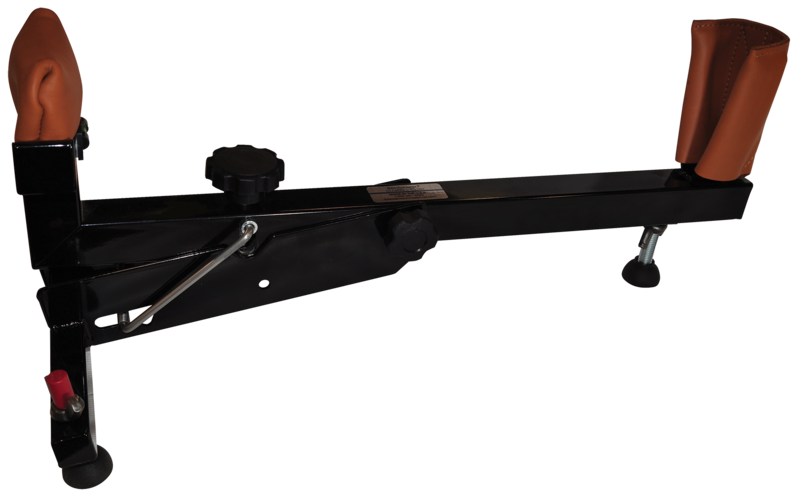 The Benchmaster Cadillac Rifle Rest is designed to allow greater accuracy for every shot; whether it is for sighting in your rifle or shooting varmints. Features include the ergonomic fine adjustment knobs, adjustable galvanized legs. There are 7 different adjustments on this model, featuring the qu.. Description: Shooting MatDimensions: 84" x 27"..
Birchwood''s Leather Shooting Rest features quality leather construction with suede top, to keep you on target and your firearm free from scratches and nicks.Description: Shooting Front RestMaterial: Leather/SuedeDimensions: 4" x 6" x 6".. The Sportster TraverseTrack Bipod allows for horizontal traverse for smooth target acquisition and tracking as well as pivot action for level shooting on uneven terrain. It features a rapid-adjust lever lock, robust tubular spring-return telescoping legs, durable all-metal construction and easily at..
Blackahawk''s Traverse Pivot Bipod combines pivot and traverse functions. Its horizontal traverse feature allows you to steadily track a moving target or change from target to target without repositioning the firearm. The pivot action lets you swivel the firearm to either side, giving you a level sh.. Featuring a strong industrial design, the Sportster Titan FXS gives shooters a solid shooting platform, holding the gun firmly on target. It allows for quick elevation and windage adjustment to accommodate a variety of rifle configurationsDescription: Bench RestType of Feet: SteelMaterial: Cast A.. 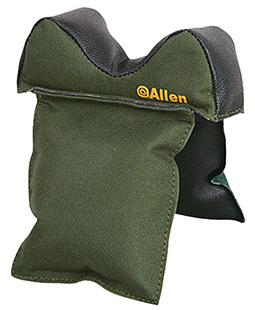 This high-grade rifle rest is designed to perform time after time, shot after shot. Featuring durable cast aluminum and steel tube construction, the Sportster Titan FX offers precise elevation adjustment and gives shooters a stable, level platform.Description: Bench RestType of Feet: SteelMaterial.. Rugged industrial design and appearance featuring durable molded polymer and steel tube construction. Compatible with magazine-fed rifles. Removable steel weight tray. Ambidextrous design. Rapid elevation adjustment of 2.25 inches. Rapid-adjust elevation wheel. Adjustable steel feet with removable p..
With 7.5 inches of height adjustment and 360-degree rotation, the Sportster Titan VR is versatility and convenience at its finest. 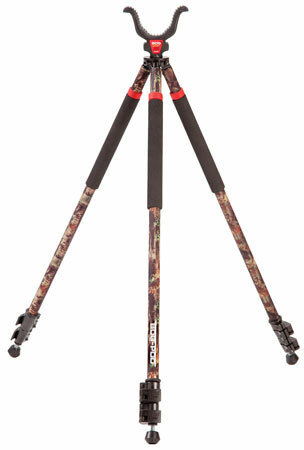 Its solid steel tube construction and adjustable design make it a must-have shooting accessory for a day at the range or in the field.Description: Bench RestType of Fee..
Bog-Pod''s CLD 3 Camo Legged Tripod has the Switcheroo Shooting System that allows the user to easily switch between accessories in the field using the same platform, accommodates all types of gun stocks and swivels 360 degrees for ease in locating and tracking your target. An inch marker on the mid..
Bog-Pod''s CLD 2 Camo Legged Bipod features the switcheroo shooting system which easily switch between accessories in the field using the same platform. It has a three-section, high-strength, lightweight aluminum legs with camo finish, universal shooting rest swivels covered in rubber to prevent dam.. The Bog Pod XSR is a revolutionary rifle support made of lightweight aluminum and designed to work with the unique quick change head system of the BOG-POD tripod shooting sticks. It provides one of the steadiest rests you can get in the field. Using the attached quick change stem, the XSR installs i..